Sprint today announced a new offer as part of its iPhone Forever program, where customers can get the new 16GB version of the iPhone 6s for $1 per month and the iPhone 6s Plus for $5 per month, with the trade-in of an iPhone 6. The carrier noted that the new offer is a "limited time" deal for those users visiting Sprint's retail locations, with the official launch of the program coinciding with the new iPhone debut on Friday morning. Just like T-Mobile's offering, the price required to pay each month will vary depending on the exact type of iPhone 6s or iPhone 6s Plus model you purchase, and the quality of the iPhone 6 that is traded in. With that in mind, customers can expect to pay around $5.77/month (64GB) or $10.53 (128GB) when purchasing an iPhone 6s, and $9.77/month (64GB) or $14.53 (128GB) when buying an iPhone 6s Plus. Those who trade in an iPhone 5s will also be able to participate in the offer, but can expect slightly higher monthly rates due to the older model of the iPhone. 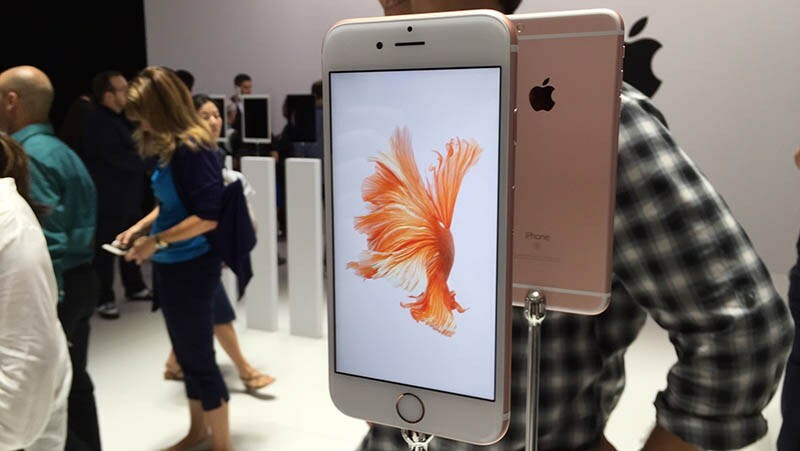 Preparations have begun for the launch of the iPhone 6s and iPhone 6s Plus. The smartphones will officially go on sale tomorrow, September 25 in first-wave launch countries including Australia, Canada, China, France, Germany, Hong Kong, Japan, New Zealand, Puerto Rico, Singapore, the UK, and the United States. ...Sprint should be paying the users at this point. I'd consider switching from AT&T to T-mobile, but not Sprint. Their coverage here (west of Phoenix) was abysmal for all my Sprint friends as recently as a year ago. They have all switched off and maybe it has improved since, but not worth the risk or hassle. Nice to see the competition though! That is a great deal provided one can get decent reception. Sprint works well for me in the Atlanta area. If I wasn't already in one of their older lease to own or return programs, I would take advantage of this deal. I would like to remind those on the forum who love to bash Sprint etc., Sprint has coverage issues just like any other carrier. None of them are perfect. If some of you want to pay top dollar for top speed, ( you know this because you spend a lot of your time doing speed test so you can brag) go ahead. For many of us, Sprint works well for our needs and location. I lived on my motorcycle touring the USA for 6mo and 18k miles of travel. During that time I had a Sprint phone and a Verizon iPad. Surprisingly there were only 2-3 times the iPad had service and the Sprint phone didn't. But, there were a few times the phone had service and the iPad didn't. Every year we shop all the major carriers and have not found a better apples to apples deal than Sprint for us. The barely noticeable performance difference just isn't worth the price delta for us. I'm on these devices while roaming around all day long. Running a business off them while taking my toddler on trips everyday. Just switched to Sprint from AT&T. Couldn't be happier. I thought no simultaneous voice and data would be bothersome but it hasn't affected me in the least. I have seen over 50 megabytes at times with Sprint. I agree every carrier has network issues to one extent or another. As a former Sprint customer, my problem with them was their customer service. Other than SiriusXM, it's been easily the worst I've ever experienced. Actually, it doesn't. It beats T-Mobile according to RootMetrics, and only a few percentage points below 2nd place AT&T. In a recent nation wide data coverage test T-Mobile was second only to AT&T and only barely. The failed attempt by ATT to buy it was great for T-Mobile because it gained a lot of frequency from AT&T. Moreover, T-Mobile doesn't charge extra for text and voice roaming. Cite the nationwide data coverage test, please? There is no denying that customer service for many with Sprint hasn't been what it should be. I have read horror stories about AT&T and Verizon etc as well. I don't know if Maurice will be able to get Sprint to where it needs to be long term. I think he is doing what he can. It is going to take a lot of commitment and capital. I do like how he is helping to keep pressure of the other companies. Increased competition is good for us consumers. So does the T-Mobile network. T-Mobile may be faster but their coverage is the worst of the main four providers.